It seems like crib sheets would be a fairly simple choice to make, but that just isn’t the case. There are more options than ever, so why settle for uncomfortable sheets when your baby can have the best? Here, we’ll walk you through our top ten picks for crib sheets, a list that we’ve compiled through a ton of research and review. We’ll get to our cool crib sheets after we look at some information. Material: What are the crib sheets made of? There are two main options when it comes to sheets: these are either going to be made of bamboo, cotton, or some blend of the two. Both are sound options. Size: How big is the crib sheet? Most crib sheets come in a standard size (52” x 28” x 9”). This allows them to universally fit on any crib mattress that you might have for your little one. Color: What color are the sheets? In multi-packs, there will usually be multiple different colors and patterns, so we’ll let you know more about what to expect in the description. Choose the ones that fit your little one’s décor! Organic: Organic sheets are going to be made of all natural plant-based materials, without putting them through any sort of chemical process. If that’s important to you, keep an eye on this information. We’ve got you covered! Machine Washable: For the most part, crib sheets are going to be machine washable. In the rare case that the sheets can’t be tossed in with the laundry, we’ll let you know here. We understand the convenience of a washing machine! Pieces: How many sheets do you get with the set? That’s important to know because you’re going to want to have multiple sheets for your baby’s crib. It can also help you assess the value of the sheets. Now that we’ve gotten that out of the way, we can get to our best baby crib sheets! We’ve taken a variety of sheets in different colors, patterns, and materials in order to give you a variety of choices. Our top pick and budget pick are highlights, so make sure to check them out first before moving on through the rest of our list. Your baby deserves comfort, so don’t settle for less! 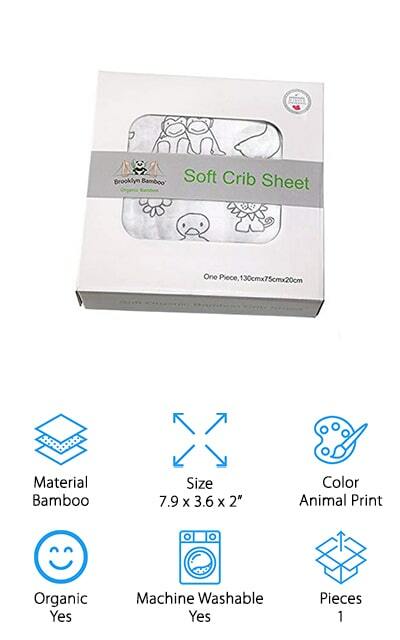 The best cotton crib sheets that we could find are in this 2-pack by Cuddly Cubs. They are made of 100% cotton jersey knit, which is soft and cozy so that your little one stays comfortable even on their fussiest nights. 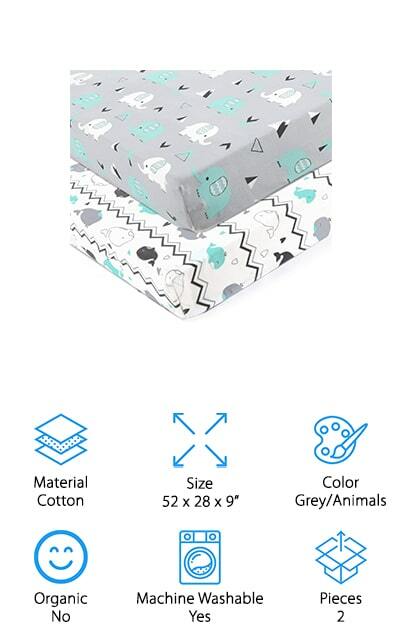 Having two crib sheets allows you to wash one and keep one on the mattress for bedtime, so it’s really convenient to have two come in a pack like this. These sheets are hypoallergenic and made in non-harmful ways, and they are pre-washed and free of pesticides. If your baby has sensitive skin, you need to try these! That’s what makes them some of the top rated crib sheets. These mint green and grey patterns are unisex for both boys and girls, so they make the perfect baby shower gift! They are machine washable and dry easily. Like your favorite T-shirt, they get softer with every wash. Plus, the available patterns are extremely cute. These cheap fitted crib sheets by American Baby Company are great for parents on a budget. 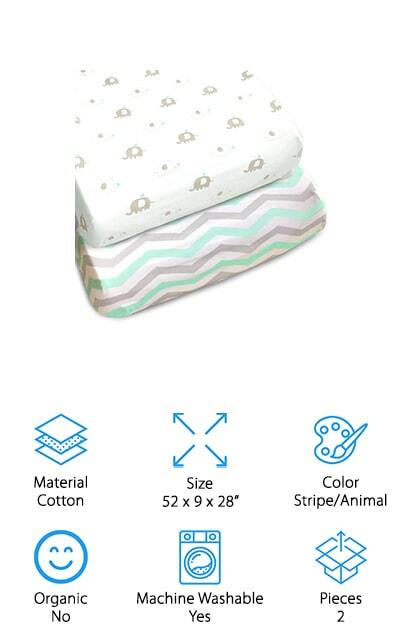 This one-pack includes a 100% Jersey Cotton crib sheet that is comfortable and will continue to get softer with every wash. They make great winter crib sheets because they are warm and feel just like your favorite T-shirt. Your baby is going to love snuggling up to them! Plus, there are a variety of colors and styles available so you don’t have to settle for unisex or generic patterns if you don’t want to. These sheets are trimmed in elastic to make sure that they stay put on the mattress, safer for your little one. You can rest easy when you’re using these crib sheets. Plus, they are a great value, and you can buy multiples to have them on hand for accidents! We love everything about these standard crib sheets, and we know that you and your baby will too. 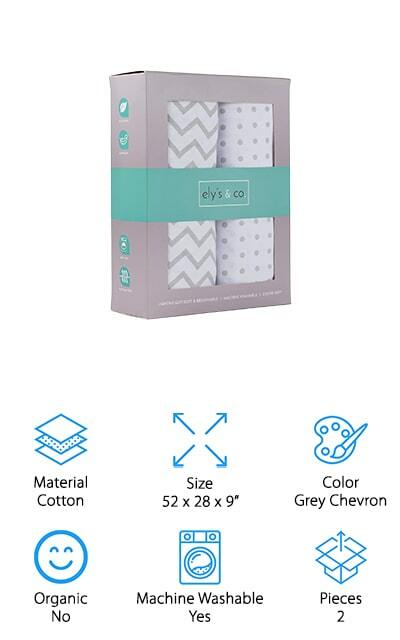 Ely’s & Co make these great unisex sheet sets that come with two different sheets. The patterns are cute and classic, and we just know that you and your little one will love them! They are made of 100% Jersey Knit Cotton, so they are both comfortable and machine washable in case there’s an accident. Plus, having two on hand makes it easy to switch the sheets out and put a clean one on. On the bottom of the sheet is a tight elastic band that will keep your sheet wrapped around the bed, creating a safer environment for your little one. You can rest easy when you know that your baby is safe. Plus, they are extremely lightweight and breathable, great for infants that tend to generate a lot of heat while they sleep. No need to get uncomfortable! Your baby will have a better night’s sleep when he or she is snug and secure. Burt’s Bees makes the first organic crib sheets on our list. This single sheet has a beautiful stripe pattern that makes it look attractive, but it is much more than that. It includes a premium elastic band around the bottom for a safe, secure fit that will keep your baby secure through the night. It also includes extra fabric overlap along this bottom edge, so it stays where it is supposed to and won’t creep up the mattress if your little one wiggles too much. It’s completely organic and is made of breathable cotton, so your baby stays comfortable. These are some of the best organic baby crib sheets on the market right now, from a company that you already know makes great organic products. 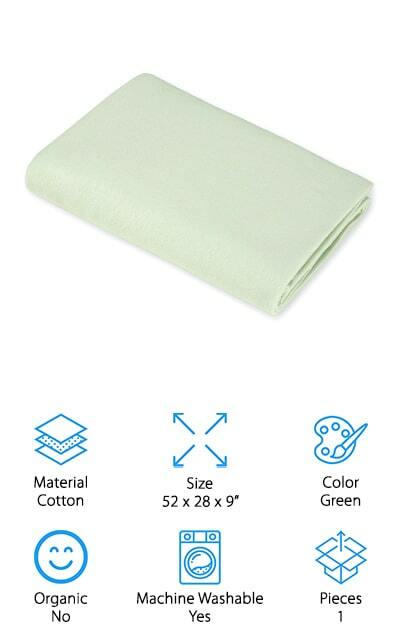 These sheets will fit standard crib and toddler mattresses, so you don’t have to worry about measuring them out. That’s great! All of the patterns are adorable, and we know you’ll love them! Brooklyn Bamboo makes the best organic crib sheets on our list, mostly because they are made with bamboo instead of cotton. Bamboo is a natural, sustainable source of fibers that have added benefits to make these sheets simply amazing! These sheets are durable and come in adorable animal prints, and they are so soft you won’t believe that they are made from bamboo! These hypoallergenic crib sheets are breathable and perfect for babies with sensitive skin and who might have had reactions to other crib sheets. These are unisex and have a cute (and sensible) panda bear pattern. They are bamboo, after all! They are machine washable and will only get softer and softer! They also make a mattress protector to place under the crib sheet to make your baby’s bed more comfortable! Don’t settle for less. When you’re going full organic with your crib sheets, take it that extra step to sustainable bamboo sheets. 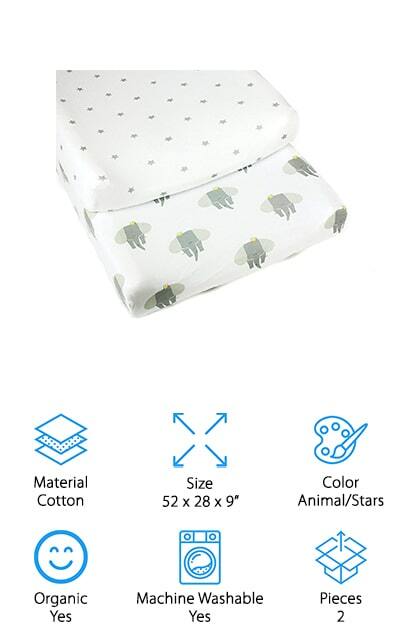 My Little North Star makes great organic baby products, and these 100% Jersey Cotton breathable crib sheets fit right in with their other products. They are made of hypoallergenic cotton, free of any harmful chemicals and common allergens. Give your baby a good night’s sleep while promoting environmental health! These sheets are so soft and comfortable that they might even pass for organic flannel crib sheets if you didn’t know any better. They are that comfortable! This set of 2 features stars and animals in unisex colors, which make them a perfect baby shower gift for a friend. They’ll fit in with just about any nursery décor and make your baby’s room cozy and cute. They have elastic bands around the edges to make sure they stay on standard crib mattresses instead of riding up with the movement of your baby. These are some amazing crib sheets, so don’t pass up the opportunity to try them out! M&Y’s unique crib sheets come in boy, girl, and unisex varieties, starting off with this cute pink princess set for a baby girl. They are made of completely hypoallergenic jersey knit cotton that is cozy, soft, and breathable. Your baby’s skin won’t be irritated by any roughness or chemicals. They are easy to place and stay where you put them because of the tight elastic band. You can place them around any standard crib mattress or toddler mattress, and when they get dirty you can throw them in the machine. 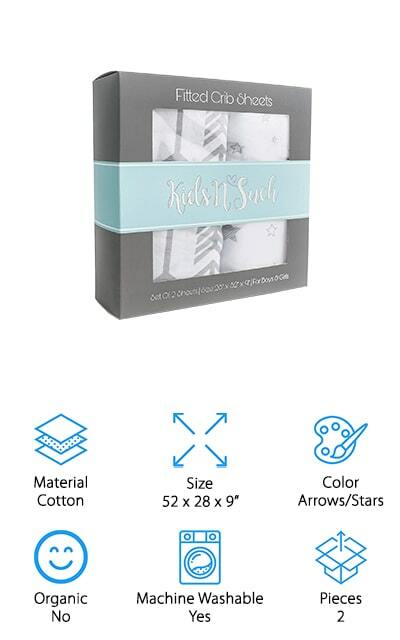 These are the only sheets on our list to come in a set of three, so they are also an amazing value and a great gift idea for a baby shower or new mom in your circle of friends. This way you have extras for when the current sheet needs to be washed. If you’re looking for crisp, comfortable cotton sheets for your baby registry, look no further! Brolex makes one of the best fitted crib sheets because it’s so versatile. 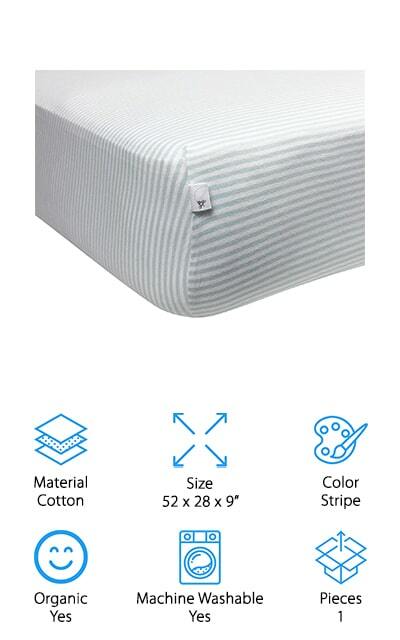 It can fit a portable crib mattress as well as a standard crib mattress, and it transfers between the two with almost no difference in the fit. It’s constructed with this idea in mind! Your baby deserves the best even when you’re traveling to friends or relatives. That’s why you should get a crib mattress that will fit standard and travel cribs. This unisex set comes with two sheets, one with a cute animal print that’s going to look great no matter how your nursery looks. You can toss it in the machine when it’s dirty and put the second sheet on your child’s bed for ease and efficiency. Because of the strength of the elastic, you won’t have to struggle to get it on, either – it pops right over the mattress effortlessly! When it comes to convenience, you’ll want to take a look at these sheets. 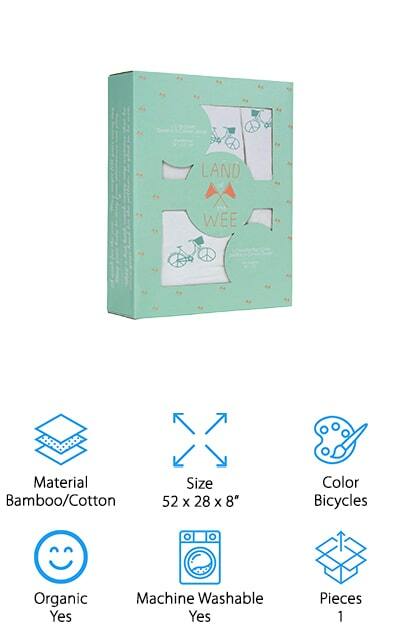 Land of the Wee might just make the high thread count crib sheets you’ve been looking for. 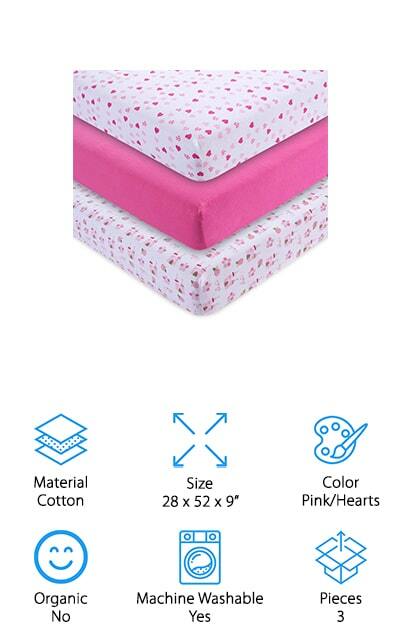 Everything about these sheets is quality and convenient, from the fact that they have been pre-washed and pre-shrunk to fit onto a standard crib mattress so that you always get the perfect fit the first time. They are organic, hypoallergenic, and antibacterial so your little one can rest easy and you can relax a little more when you put them down in their bed. It’s anti-static so it won’t irritate them, and all of the different components of this sheet work together to make it safe for their skin. It’s made of natural organic bamboo, more sustainable than cotton or even hardwood trees. You’re making a wholesome and environmentally-friendly choice with these crib sheets. They come in a variety of unisex designs, including this aqua blue option that easily compliments the décor in just about any nursery. You’ll love it! Last but not least are these Kids N’ Such Crib sheets. These come two to a pack and include unisex and friendly design like art deco arrows and stars. It’s a great gift for a baby shower, especially if your friends chose not to learn the gender of their child. This two-pack is convenient because it allows you to put a sheet back on the bed when you’re washing the other one. When you do need to wash them, you can throw them into the washing machine with the rest of your laundry without worry. These 100% Jersey Knit Cotton sheets are comfortable and breathable, allowing even the warmest of sleepers to get a great night in. Don’t wake up to a fussy baby – you’ll both sleep better when you’re using such comfortable, plush sheets for your precious little bundle. And they’ll only get softer with each consecutive wash! Choose the sheets that are going to serve your baby the best.